Click Admin > Settings to change the default settings for your account. The power options feature lets you to specify the maximum amount of time that VMs in an environment can sit idle. The environment is shut down or suspended after the idle time has elapsed. For more information, see How the power options feature works. Check Enable automatic power settings. From the Schedule menu, choose how long environments can sit idle before the power option is applied. From the Actions menu, choose the power option that will be applied. The default power option settings automatically apply to all new environments created in the account. To enable power options for existing environments, edit the power option settings in each environment. For instructions, see Enabling automatic power options for an environment. To view and change current usage, subscription, and account limits by region, see Viewing usage data. The shared drive is an easy way to exchange files between VMs in your account. Access Shared Drive via FTP – Displays the driver’s FTP address and credentials, allowing you to use an FTP program (like FileZilla) to upload and download files from the drive. Determine Shared Drive Usage – Opens the article: Determining usage of the shared drive. Request an increase to your shared drive – Creates a request email to our support team (support@skytap.com). For more information, see Transferring files to a VM. Enter an http: site, https:// site, or mailto: email address (for example, http://www.example.com, https://www.example.com, or mailto:support@example.com). If you do not specify a custom URL or email address, sharing portal users will be directed to the Skytap help site when they click Help. When you edit this setting, you are changing the global default for your account. As users create sharing portals, they can override this default by providing a different URL or email address in the sharing portal’s Support contact options section. Click Enable auditing webhook. The Auditing Webhook section expands. Type the URL where the data will be sent. All audit events for the account will be sent to the destination URL. If the destination site is configured to use TLS encryption (optional, but strongly recommended), type or paste the public Certificate. If the destination URL is not available or stops responding, the webhook service will attempt to reconnect once per minute for up to six hours or 200 attempts. If it can’t reconnect, the webhook service will be disabled until you reconfigure it. 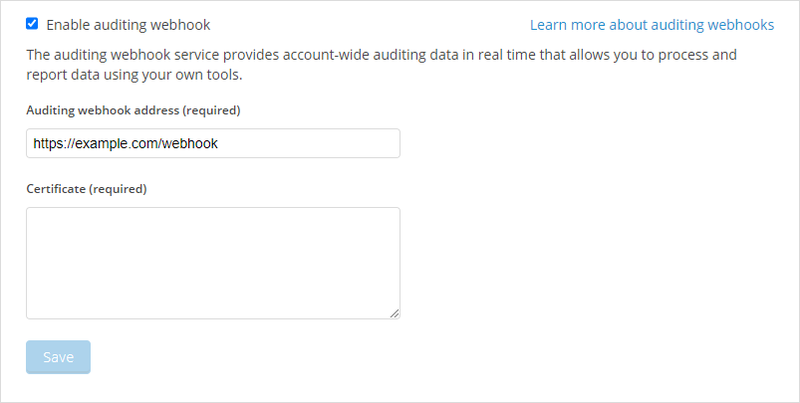 For more details about auditing webhooks, see Configuring the webhook service for audit data.